Alright, I'll have to explain that title. To be perfectly honest, the more I've learned about theatre and my own preferences in it, the more wary I've become of productions in my home country. There will probably be a separate blog post on this subject because I've actually given a lot of thought as to why I'm generally so unimpressed by Finnish theatre. Fortunately, though, I get to say generally and not always. Because sometimes, a production like The Curious Incident of the Dog in the Night-Time at Tampereen Työväen Teatteri will reveal how much potential there could be even in my home town. The triumph of The Curious Incident of the Dog in the Night-Time began in 2003, as a very successful mystery novel written by Mark Haddon. The novel won the Whitbread Book of the Year Award and the Guardian Children's Fiction Prize, just to name a few, and in 2012 it was adapted to the stage by Simon Stephens. The play went on to win a staggering amount of seven Laurence Olivier Awards, including Best New Play. So, when Tampereen Työväen Teatteri (one of the two biggest local theatres, originally a workers' theatre) staged it this autumn, I was both intensely intrigued and somewhat reassured to see a production that had already won so much acclaim in London. Now I can say, without a moment's hesitation, that TTT's Yöllisen koiran merkillinen tapaus is the best theatre production I have ever had the good fortune to see here in in Finland. It is respectful of the original Britishness of the play, simple yet stunningly effective in its visual execution, abundant in versatile actors and masterfully directed by Otso Kautto. The play's rather singular title originates from a phrase that Sherlock Holmes coins in The Adventure of Silver Blaze. The protagonist is 15-year-old Christopher Boone, who starts investigating the death of his neighbour's dog, à la the Great Detective whose adventures he reads avidly. Asperger's syndrome makes it difficult for him to interact with people and his father seems especially opposed to his investigations, but eventually the clues lead Christopher to a revelation even more devastating than the identity of Wellington's killer. The entire nine-man cast of this production is superb, and Jyrki Mänttäri does the most admirable job of all in carrying the weight of the principal role. Mänttäri is of course considerably older than his character, but he expresses Christopher's unwavering conviction, shattering feeling of betrayal, and everything in between with such credibility that you won't doubt for a second that you are watching a 15-year-old boy who never lies and doesn't understand metaphors. Auvo Vihro and Minna Hokkanen, a married couple in real life, make Ed and Judy's scenes thick with tension, and the way Miia Selin plays Christopher's teacher makes it perfectly self-evident that Christopher would draw inspiration and comfort from her when he faces a dilemma. The rest of the cast play a platoon of minor roles and are all extremely enjoyable to watch – Eeva-Riitta Salo's Mrs Alexander and Petra Ahola playing an ATM machine especially had the entire audience in stitches. Director Otso Kautto deserves all the praise I can possibly give for his work because all the (numerous!) funny bits roll on effortlessly, without ever lapsing into the domain of typically Finnish, overblown, eye-roll-inducing "comedy" with giant quotation marks. Equally, all the serious moments are given the space and the weight that they need in order to reach the audience. The scene where Christopher finds the letters (I won't be more specific than that, in case someone doesn't want spoilers about the plot) is especially chilling, combining Mänttäri's excellent physical expression, the best dialogue between Vihro and Hokkanen, and what is in my opinion the most genius part in Simon Stephens' script. Normally, I'm not a visually-minded person and it shows very much in how I appreciate different forms of art. Reading a good book or listening to a wonderful piece of music is the best thing in the world, but place me in front of a painting and my mind goes completely blank, regardless of how exquisite and/or famous it is. I suppose being practically blind in my other eye might have contributed to my inclination of appreciating the none-visual aspects in life and in arts. When I go to the theatre, I'm always on the look-out for well-written dialogue and good delivery from the actors, rather than impressive staging. However, I'll have to say something about the visual execution of TTT's The Curious Incident of the Dog in the Night-Time, because it was brilliant enough that even I noticed how brilliant it was. Once again, that brilliance was founded in fearless simplicity. 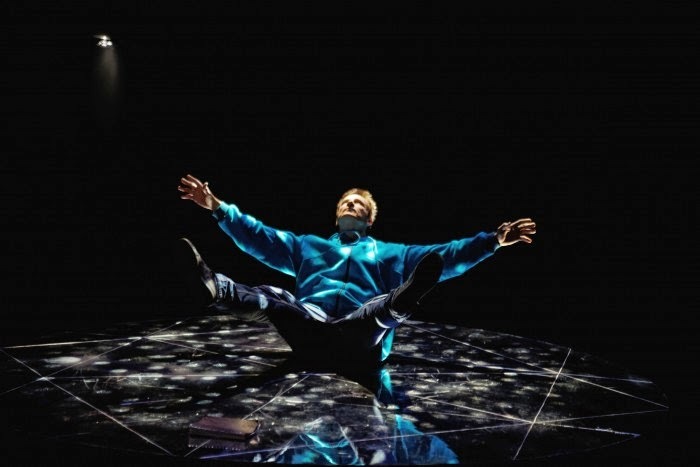 In the first act, there is nothing on the stage except a small, circular platform where Christopher stays throughout the action; other characters talk to him from the main stage and sometimes sit on the edge of his "bubble", but never quite share his space. It didn't hit me till the intermission that all the various scenes in the first act had taken place on this bare and simple staging – the fact is, the stage had served the story so accurately and the actors had carried the action so effortlessly that I doubt it ever crossed anyone's mind that the stage itself should somehow visually represent the setting. In the beginning of the second act, Christopher undertakes a journey to London, and his safe bubble is gone. Instead, there are grey walls on wheels that look rather menacing, especially as they circle around poor, lost Christopher in a representation of his new, frightening surroundings. The entire journey sequence is marvelously presented; the walls transform into a Christopher-crushing tunnel, a train, a London tube station and a bedroom without a moment's hesitation. What to most people is a simple movement from point A to point B is an adventure of heroic proportions to Christopher. The atmosphere is set so accurately and the actors deliver so powerfully that you find yourself rooting for Christopher as if he was on a quest to save the world. As someone who has a very public long-distance love affair with London, I could only adore that short, but effective representation of the tube station in particular. It's really just a little moment where Christopher is surrounded by the diverse layers of the metropolis' population and an operatic busker provides background music, but I knew instantly where we were and rejoiced in the moment. If you appreciate good theatre to any extent and if you happen to be anywhere near Tampere, I think you should see this play. I repeat, it is the best Finnish theatre production I have ever seen. Mark Haddon's novel and Simon Stephens' script make a solid foundation from which the cast and the production team have constructed a theatre experience that takes every advantage of the cleverness and truthfulness of the story they are telling.